Posted by Ada Wang on 5/23/2018 4:04:06 PM. After the celebration of Black Friday and Cyber Monday, what would you do to welcome the upcoming Christmas for your family and friends? If you are thinking about finding a present that meaningful and unforgettable, what about gifting an eBook? I believe there is something wonderful about giving the gift of an e-book because you can share what you read and love with your friends. They will dive into the same world you explored, and then you can have a great talk about this author, this book, or something else related to the gifted book. We're so lucky that almost all booksellers have added options to their websites to make giving e-books easier. Amazon and B&N both let you gift a specific eBook. 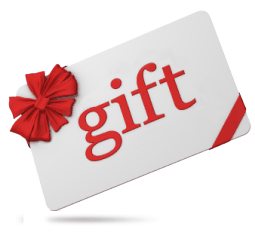 And iBooks, Kobo and Sony all have gift card options (as do Amazon and B&N). But this will vary according to what kind of e-reader your friend uses. So here I put together a how-to guide, which teachs you 3 different ways to gift an eBook including Kindle eBook, Nook eBook, iBooks, Google Play books, etc. Remember that this step is very important because our friends will not be able to read the book if the gifted eBook isn't compatible with his or her devices. After you know the recipient's reading device, you can purchase the book from the dedicated stores that their eReaders supported. If your friends or family are using a Kindle or Nook device, this method works pretty well and very easy to go. To purchase a specific eBook as a gift, just find the book you want to gift on your preferred site. Then select the option to purchase on any book pages. In common these options are always these words like “Send as Gift”, “Give as a Gift”, or “Buy As Gift”. Just click that button or link to process your gift purchase. All you really need to do is just choosing the delivery date with the email address of the recipient. Then the vendors will help you send eBooks as gifts. 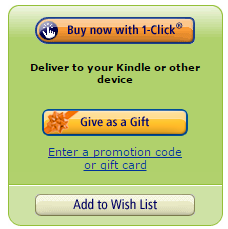 Here I take gifting an eBook on Amazon as an example. Firstly head to Amazon and find the Kindle version of the title. Then click the "Give as a Gift" button. Enter the personal e-mail address of your gift recipient. Alternatively, if you would like the gift to be a surprise on the chosen day but not right away, that's OK. Find the option to specify a delivery date. You can also use Kindle Unlimited to give Kindle books as gifts. Except Kindle and Nook, other stores like iBookstore, Google Play, e-book gift-giving is a little trickier. But we can purchase a gift card with a note that includes a suggested book title. 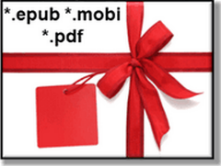 In my opinion, I think it would be better to gift a card rather than an eBook. Maybe the selected books we gift are not his taste, or the gift (especially the book format) might have been purchased in the wrong store, such as, he uses an iPad but he likes reading Kindle books with Kindle reading app but not the iBooks app. What's better, nearly all of the mainstream eBook stores provide us the option to buy a gift card. But maybe you are still confused about something. Q: What if my friend doesn't have the dedicated device? A: When you send a book to a friend but they don’t have a dedicated eReader, don't worry all the formats from major vendors can be opened with free reading apps on a computer, smartphone, or tablet. Q: Could I gift a specific eBook for iPad? A: Typically in this case we could only send a gift card to your friend on iTunes. But if you find one book and make sure that you friend will love it very much, the other option is to buy this specific book from Nook or Kindle store, then suggest he or she reads the book with one of free accompanying apps for IOS device. Q: What if they don’t like or want the eBook I gifted? A: As always, a well-thought-out gift of an e-book is usually well-received, but if the recipient already reads the eBook or wants to exchange the gift, most of the major distributors do allow us to exchange the gifted eBooks for other books or gift cards when the gift is redeemed. Q: How to give Kindle Unlimited as a Gift? A: Amazon also provides us a super easy way to give Kindle Unlimited as a gift. Go to the landing page Kindle Unlimited gift giving, then select a membership duration and add it to your cart like a regular purchase. Proceed to checkout page you will be directed to a gift option page where you can enter the recipient’s email address and the delivery date. Both method 1 and 2 do demand us to know which device or app that they are using. This means if we couldn't make sure of this point we couldn't gift eBooks to them. Yes we can ask them about it, but if so how can we bring them a big surprise? You know the meaning of sending gifts is not the gift itself, but the feeling we convey when they receive it. After we finished reading one book, and then did really think it is also worth reading by our family or friends, we can gift this book to them. But if so, we should buy the same book again. Nonetheless if there is a good solution to let us share it with others, things become easy to go. And, if we want to gift one book to several people, then we should buy the same book many times. If you select this method 3 I suggest, you can select several books you loved and then share them with many people. You just pay money for one book, but a lot of your friends can read them. The most important thing is the case that with this method you can gift an eBook with different formats and then package them together so that our friends could select any format they like, no matter which device they use, no matter which app they love. We buy gifts to our friends because we want to make their life more convenient and colorful, but if you select method 1 or 2, we could only select book as Kindle format or EPUB or PDF, which brings inconvenient instead. This method is easy. The needed tool is Ultimate eBook Converter. It helps you get rid of the (DRM) limitation that reading a book on a dedicated device and app. And it also supports converting books between EPUB, PDF and Kindle mobi. So you know that it can deal with books from nearly all of the vendors. 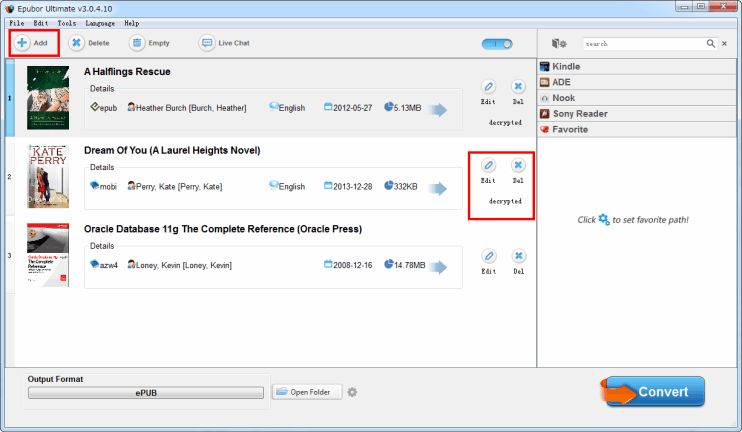 With it you can also back up your own books, read them on multiple devices. Gift for friends and also benefit ourselves. Save money and enjoy more books. Maybe you have downloaded many books on your devices or computer, then you just need to add them to this tool. If find some new books you want to gift, buy for yourself and download to your computer. Then add these gifted books to this program. From the interface you will see words "decrypted", it means that you have removed the DRM limits from your books. Then just choose the output format. Here I want to advise you converting the book (you want to give) to each format. No matter you know the device (your friend owns) or not, prepare different formats of one book will make them happy and save their time to change different reading apps. This is the true "convenience", yes? For example, select common eBook "EPUB" and click on "Convert" button. Soon it will pop up a window that gives you the EPUB format. But here don't close the window of the software, continue to select other common format "Mobi" and "PDF". After all things have been finished, from these output folders select the book you want to gift, then package them together. You can renew a folder then copy them to it. My own suggestion, in this folder you can also put a beautiful eCard with your own words to convey your thanks, celebration, wishes to your friends, family, colleagues, teachers, and more people you love. Gift the same book is very easy, on chosen day just send emails to different people by appending the folder that contains different formats eBooks and the cards.